I am not an early riser. I have been planning for years on end to get up early in the morning for workout sessions but I have failed on each occasion. However, my dear friend, Yogesh is a fitness enthusiast. Every Sunday, I used to see his pictures of him cycling through Connaught Place on Facebook. Last time when I met him, it was during the Ramlila Walk in Old Delhi where he informed me about Raahgiri Day, an initiative that provides citizens with the opportunity to reclaim their streets, connect with their community, celebrate their city and hence, reclaim their lives. Many Sundays passed and I never got up on time to attend Raahgiri Day, let alone cycling and walking. This Sunday, I made it a point, come what may, to wake up early to be a part of Raahgiri Day. I made all the arrangements on Saturday night, asked a couple of my friends to wake me up early morning by ringing the phone continuously unless I answer them, set three back to back alarms at an interval of five minutes each so that I could not snooze them and sleep again. And I finally I made in to the Raahgiri Day. I spent three hours there and enjoyed each second of it. The children were skating, senior citizens were walking, and youngsters dancing to the tunes of Yo Yo Honey Singh. It was an amazing experience. I walked around and did some cycling too. While returning back to my home, my friend Shubhash and I got off the metro at Vishwa Vidyalaya station and hired a cycle on rent at Rs 10 for 4 hours to explore the lanes of Kamla Nagar, Shakti Nagar and Malka Ganj. 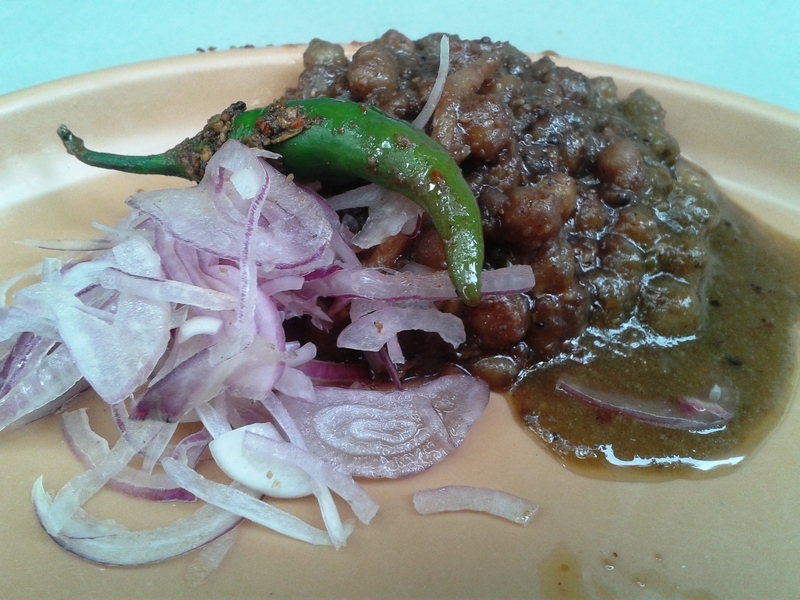 We stopped at our first food joint – Banshi di Hatti, Rawalpindi ke Chhole Bhature, shop number 5877, Jawahar Nagar, Malka Ganj Chowk (contact numbers: 9811160907, 9811142388). Banshi was the man who started this shop after the partition, originally in Haridwar and later moved to Delhi, where he sold chhole bhature outside the railway office on Mall Road for few years. 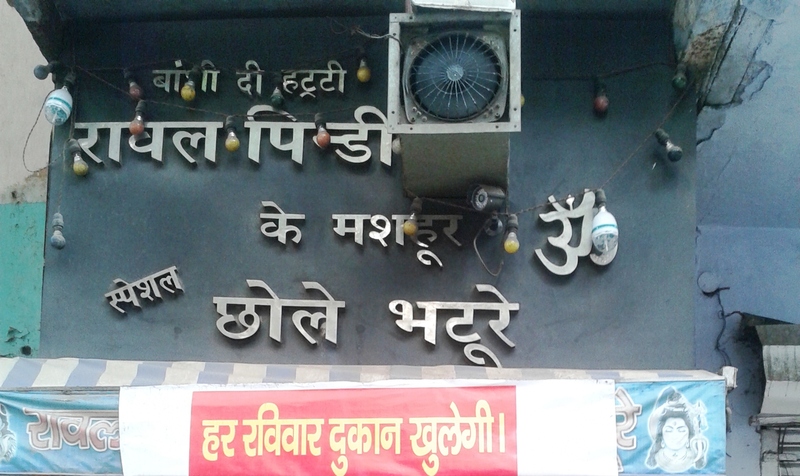 In 1954, Banshi moved the shop to the current address in Malka Ganj. The shop is now the responsibility of the third generation; Aman runs the eatery, and his father Swarn supervises the quality of the food. We ordered paneer ke bhature (priced at Rs. 50) with chhole. The taste was simply divine. The chhole were not that oily and the texture of the masala was intact. Aman added a spoon of chutney over the chhole, a mixture of anardana, pudina, dhaniya, khatai-mukassar, and hari mirch. The pindi chane, kabuli wale is boiled continuously for four hours and then cooked with home-made masalas. Aman opens his shop early morning at 4:00 a.m. to start the preparations. From 8 a.m. till the stock lasts they serve paneer and aloo ke bhature with chhole. After having had my fill with Shubhash, my fellow foodie, we rode the lanes of Ghantaghar, Shakti Nagar, Kamla Nagar, and Patel Chowk to find out and explore more such food joints for breakfast. The journey that started with Raahgiri ended with more food explorations and a plan to conduct Breakfast Trail Part II, this coming Sunday. All thanks to our friend, Yogesh Khanna.